It was something that came out of desperation. I wanted my teaching career to last more than a year! I couldn’t get girls to come to my classes, they were too boring. Every once in a while, if you’re lucky, you meet someone so inspiring that you find yourself saying ‘wow’ whenever they finish a sentence. We are especially fortunate in the spa world: it seems to be full of those kinds of people. None more so than Sheila Cluff, Founder and Owner of The Oaks at Ojai. Not just because of what she has done, but also because of what she continues to do. To try to put Sheila’s life and work into some kind of perspective, next year she celebrates 40 years of spa ownership. When she opened The Oaks at Ojai in 1977, it was one of only a handful of spas in California, a state that now has thousands. But if that was the highlight of Sheila’s career, it was the culmination of two decades of pioneering work in wellness and health. Work which included the small matter of inventing aerobics. “It was something that came out of desperation. I wanted my teaching career to last more than a year! I couldn’t get girls to come to my classes, they were too boring. So I persuaded my school principal to buy a piano and hire a piano player – there was no easily portable music technology back then – and I started what I initially called cardiovascular dance”. By plotting positions around the gymnasium and using popular music, Sheila was able to get girls not just to participate in her classes, but to love them. And so aerobics was born. 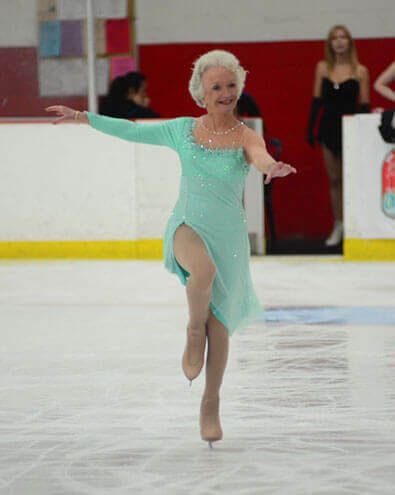 She is also looking forward to the ski season (“I intend to do it into my 90’s”), partly because she gets a free ski pass now that she is over 80. They don’t make too many of those free passes. They don’t make many like Sheila Cluff either.